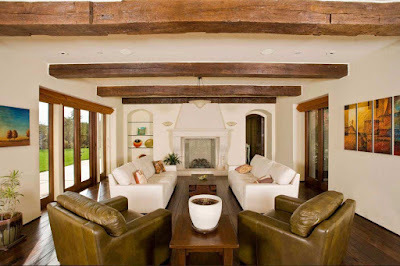 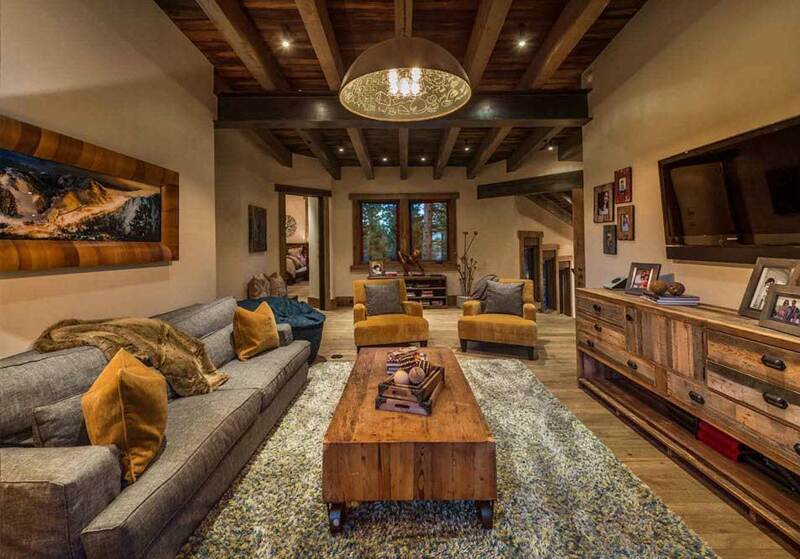 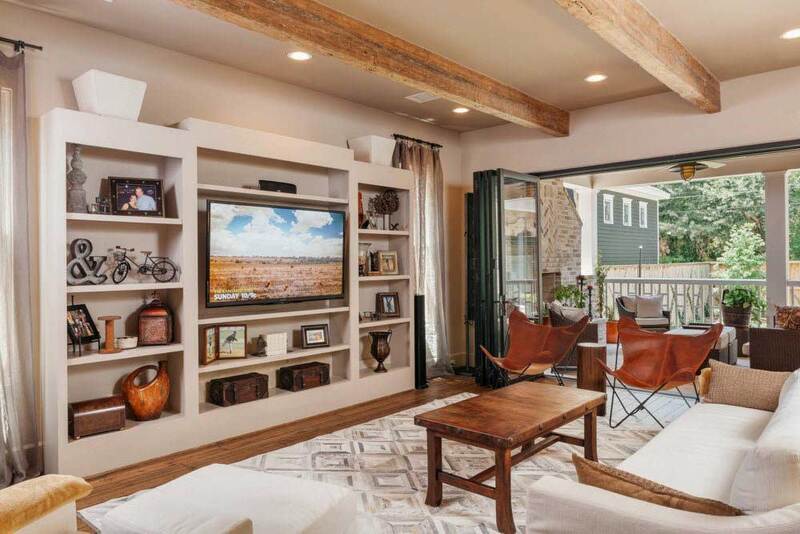 The ceiling with beams brings a sense of home comfort and warmth to the interior of living spaces. Regardless of whether the beams are structural features of the room or perform an exclusively decorative function, the design of such a space is transformed. The ceiling with the beams, executed in contrasting with the entire surface of the ceiling color solutions will attract attention, create a special optical effect of the interior. But even the elements of the ceilings, painted in one tone with the ceiling, will not be left without attention. Due to its structural and distinctive texture, the ceiling beams made of wood or other materials become an outstanding element of any interior. 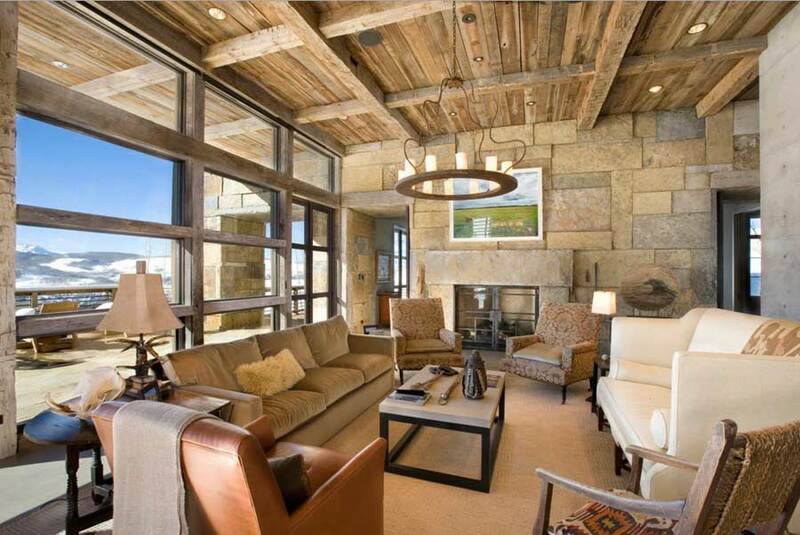 to the beams of wood, metal or stone, you can mount various elements of the interior - from pendant lamps to TVs. 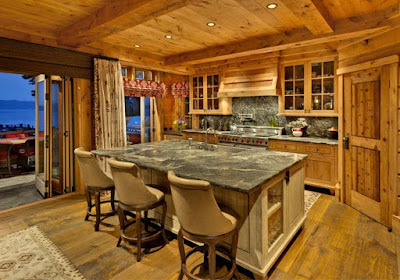 polyurethane - this artificial material is able to simulate almost any surface - from wood to stone. 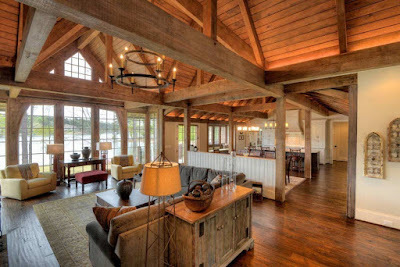 A significant feature of the beams of polyurethane is the low weight of products. 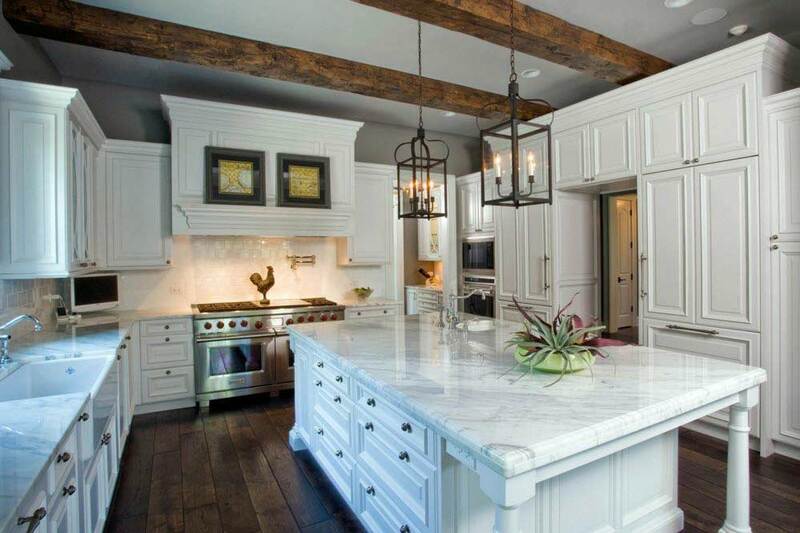 Of course, the cost of artificial finishing elements is lower than their natural counterparts. Such beams can be used in the interiors of any stylistic accessory, it all depends on the size of the premises and the quality of the imitation of "wood" or other materials. 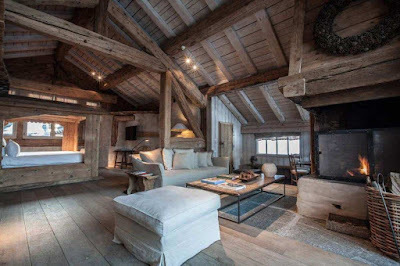 the budget for repairs - the cost of beams can differ at times, depending on the material of manufacture, the size, and complexity of the modification of structures. 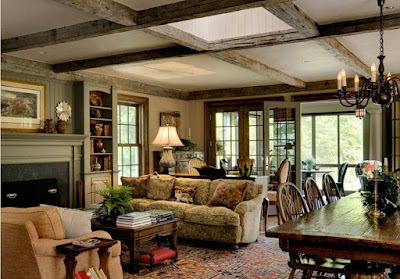 It is with the living room that we most often associate the decoration of the ceiling with the help of beams. 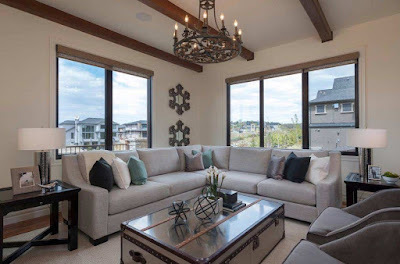 A spacious room for family gatherings or reception of guests is a room that more than others need to create not only a comfortable atmosphere but also originality because it is the hallmark of a home ownership or apartment. 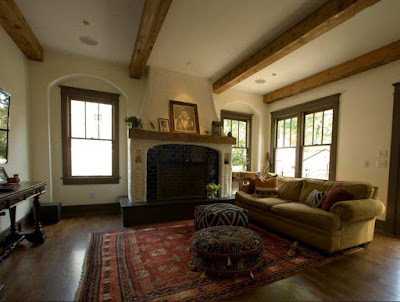 If the use of ceiling beams in the interiors of the living rooms of private houses of an urban or suburban type no longer surprises our compatriots, then to decide on the use of this element of the interior in the apartments still causes some bewilderment. 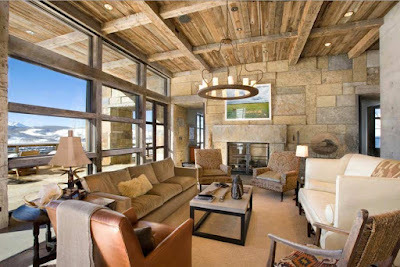 Meanwhile, the use of natural material or its spectacular imitation within the living room of city apartments brings that natural warmth, which is so lacking in a noisy and gassy metropolis. One of the options for creating a ceiling in the living room of a private house is the use of wood as a material for facing panels and decorating the surface with beams. 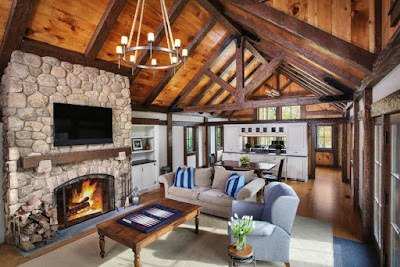 In addition to the fact that the wooden ceiling adds natural warmth to the character of the interior, it can serve as a screen for the placement of engineering systems - ventilation and wiring. 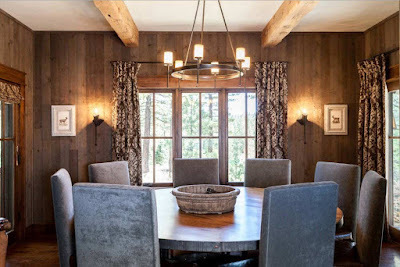 Under the wooden ceiling panels or lining can be built lamps, and to the beams to hang chandeliers. Another way to decorate the ceiling in the living room of a private house is the whitewashed surfaces of boards and beams. 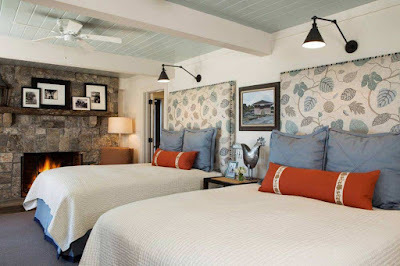 For rooms of small size and rooms with sufficiently low ceilings, it is better not to use a dark color for the execution of the ceiling decor, so as not to create a visual overhanging effect of pressure. 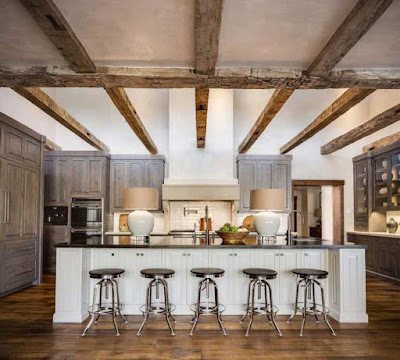 You can also use a contrast combination of light-colored ceiling and the use of dark wood (or its spectacular imitation) for the execution of decorative beams. 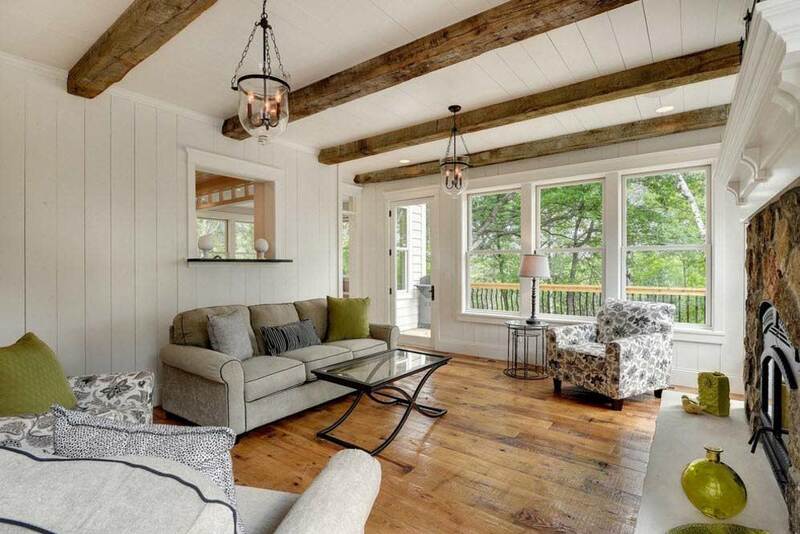 The color of the beams can be repeated in the design of windows or doors, some elements of furniture or finishing of floors, with this approach the interior will look harmonious, completed. The presence of rusticism in the modern interior of the living room will create an uneasy original appearance of the room, but also raise the degree of originality of the entire house to an incredibly high level. 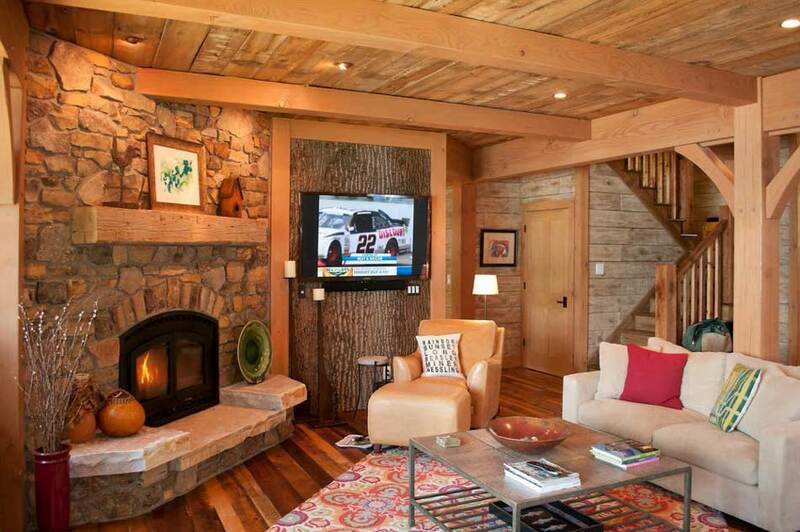 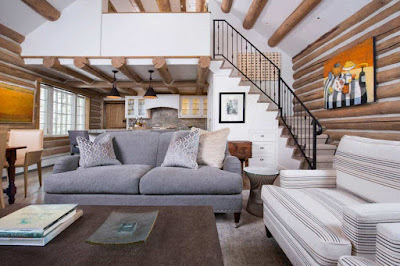 Against the backdrop of the modern design of a spacious living room, roughly trimmed logs or timber bars look contrast, despite the use of a neutral color palette. 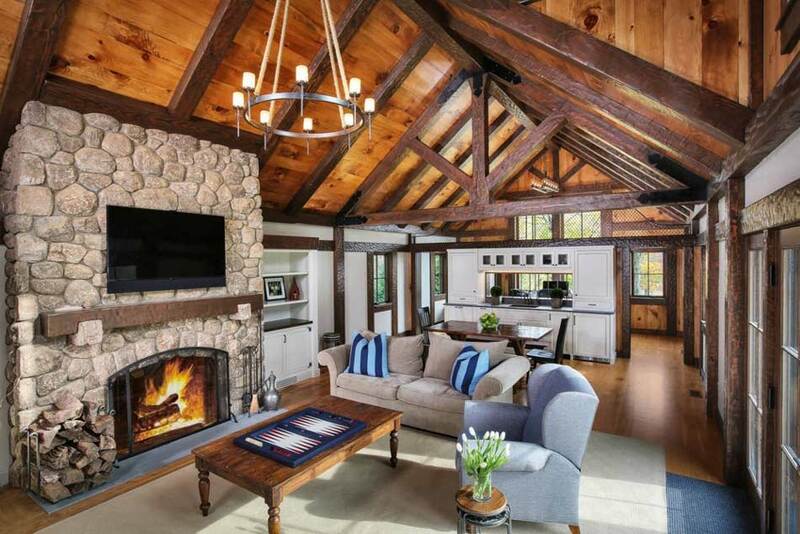 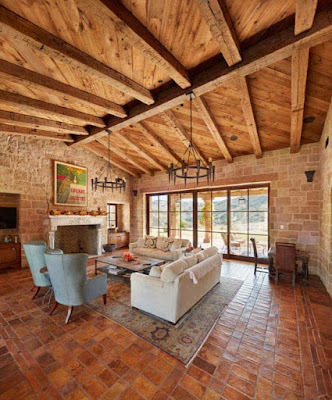 Usually, the rustic execution of the decorative ceiling beams is "maintained" and the corresponding decoration of the fireplace zone the space around the hearth is lined with large stones, as if not processed. Ceiling beams, made of the same wood as the main living room furnishings, will look great and complement the harmonious design of the room. 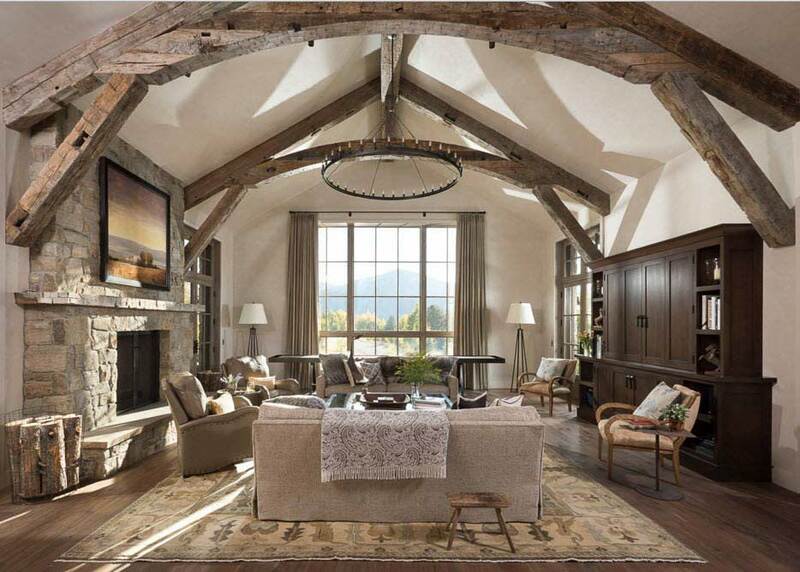 Often, beams for the ceiling and entire ensembles of storage systems create an original and at the same time an organic alliance. 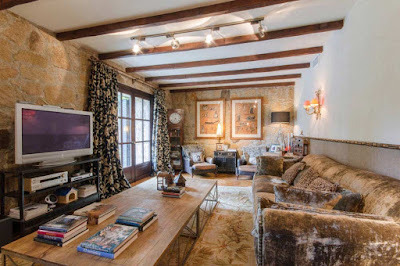 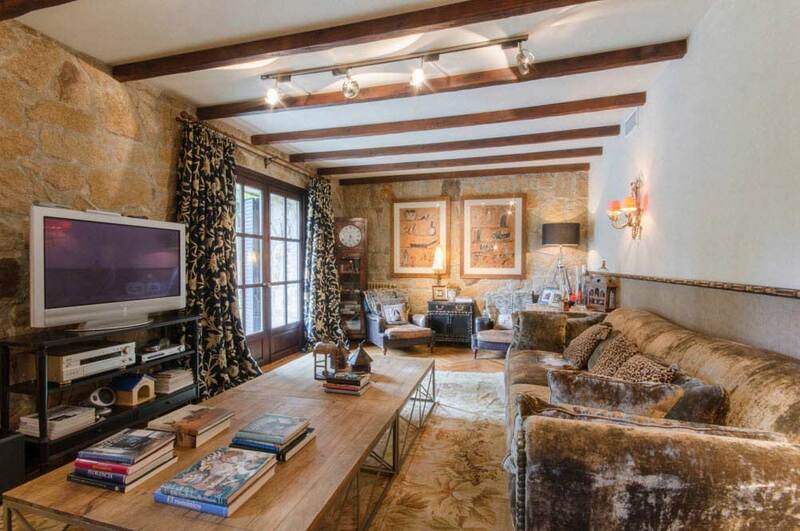 An example of the introduction of an element of constructivism in the design of a living room located in a private house with decorative ceiling beams ideas. 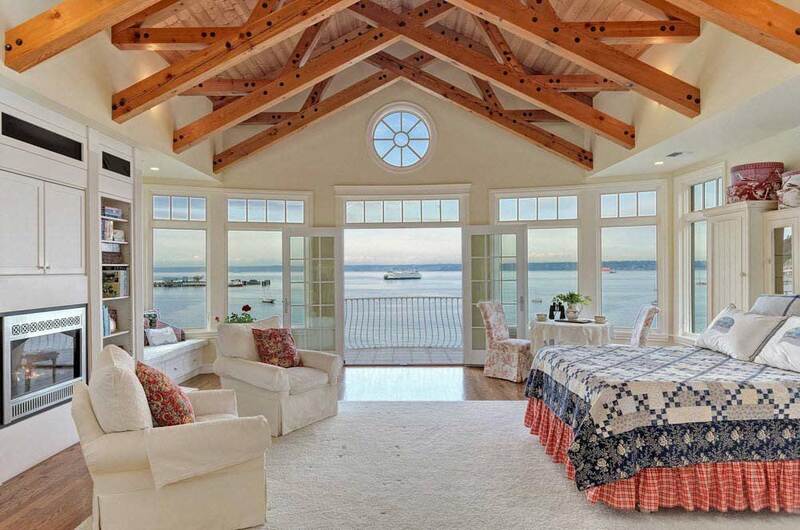 The use of ceiling beams to decorate the ceiling in the bedroom is an infrequent design for our country. 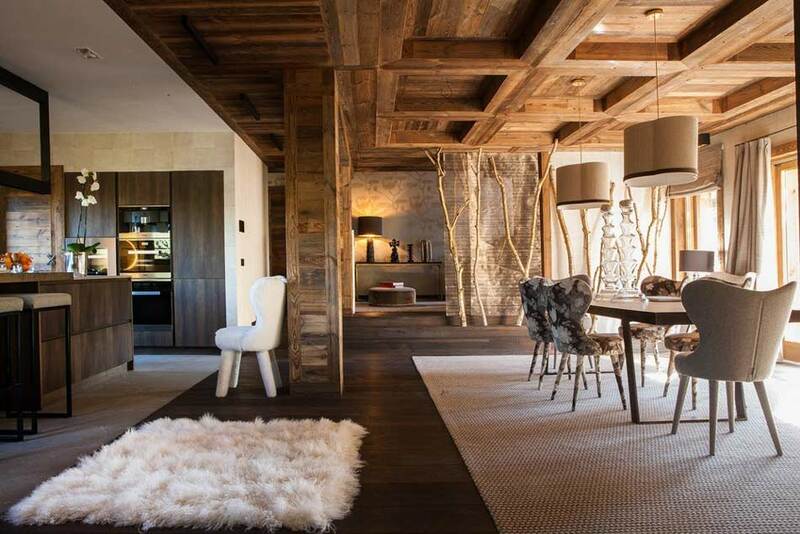 But in European design projects, such a constructive and decorative solution can be found quite often. If the height of the ceiling in the room for sleeping and rest allows you to use the decoration in the form of beams, you should not miss this opportunity. 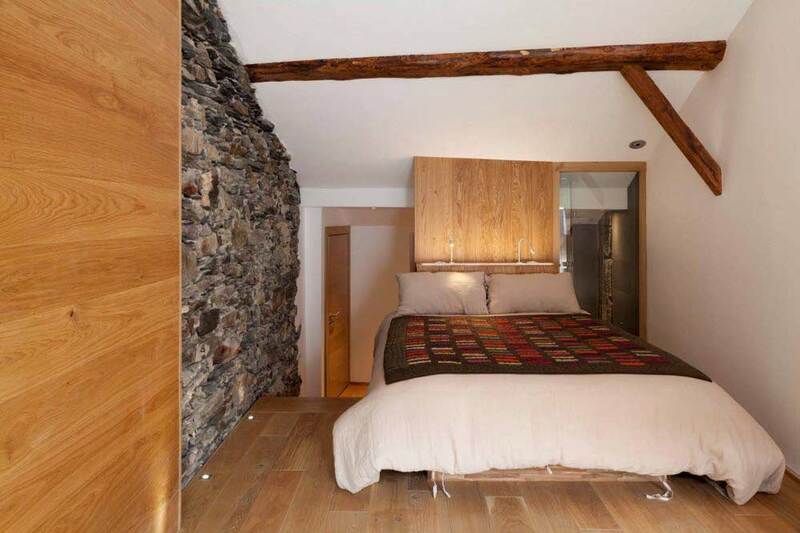 Depending on the material and color of the execution of your beams, they are able to bring in the character of the interior of the bedroom the structure, dynamism or trend of natural warmth and coziness. 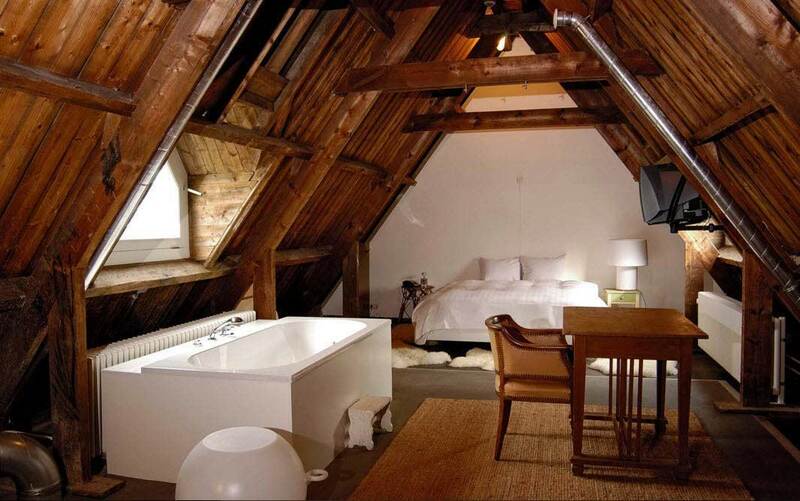 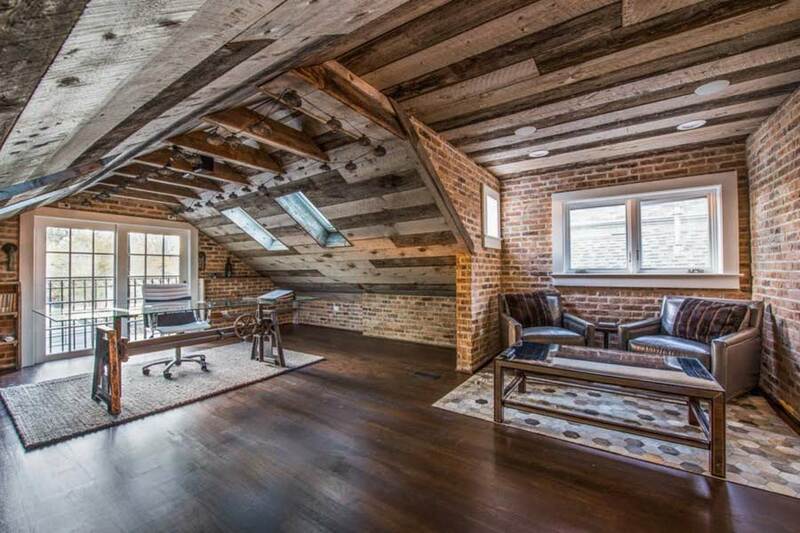 For a bedroom in the attic, a wooden ceiling with ceilings and beams is a logical design option, because all these interior elements are design features and act not as decor, but as supporting products supporting the frame of the building. 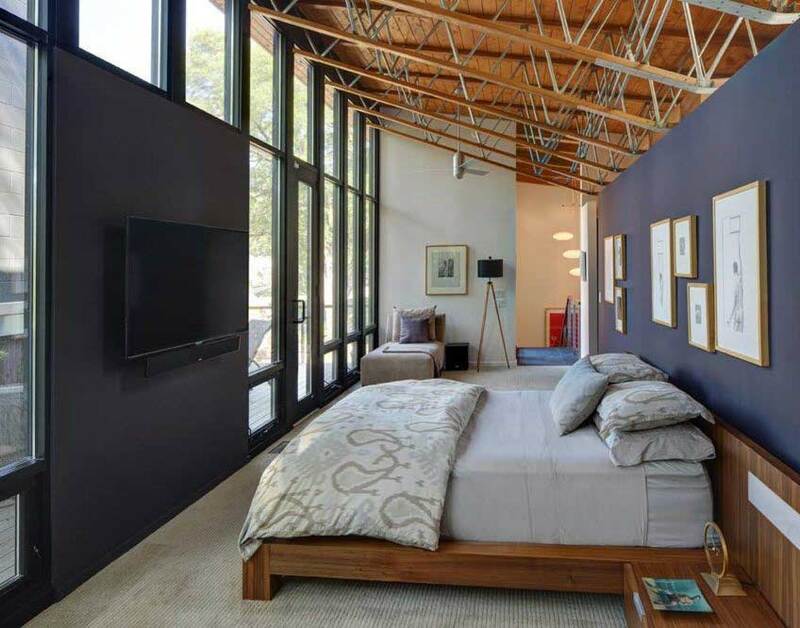 In such spaces, it makes no sense to hide the large bevel of the ceiling behind the drywall screens, because so much of the height of the room hides and it loses not only square meters but also a sense of space and freedom. 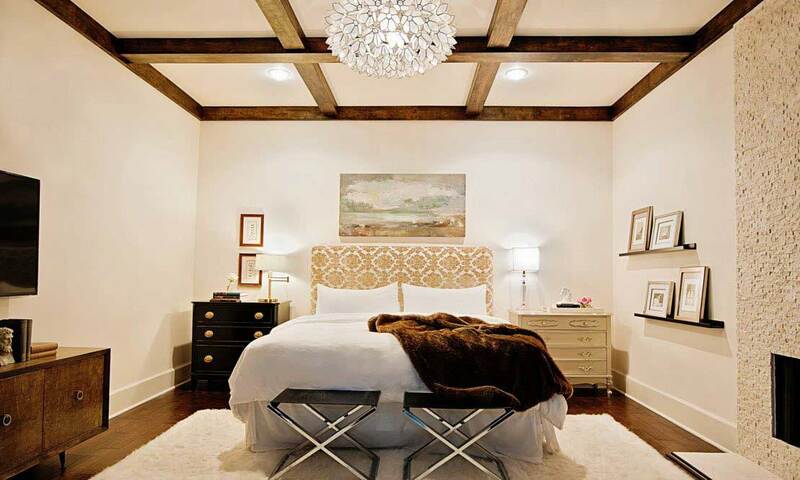 Ceiling beams in the bedroom can be solved both in one with the surface of the ceiling color, and act as a contrast element. 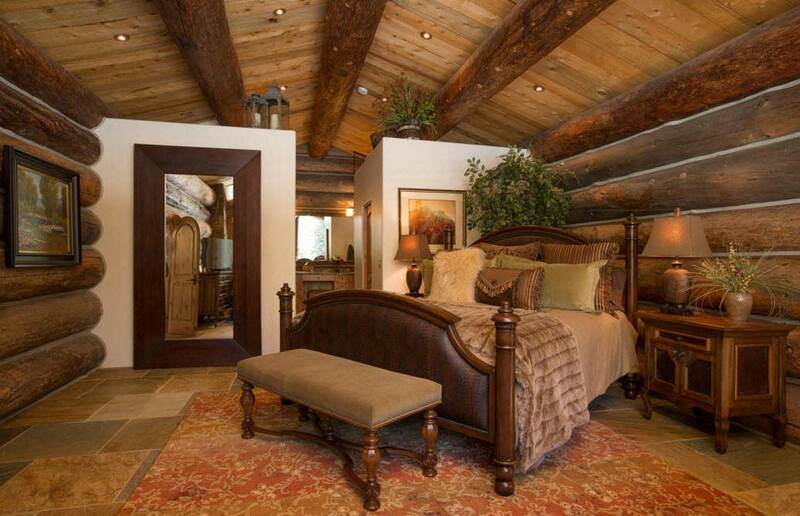 Organically looking beams, in color repeating the natural pattern of flooring or furniture - bed, for example. 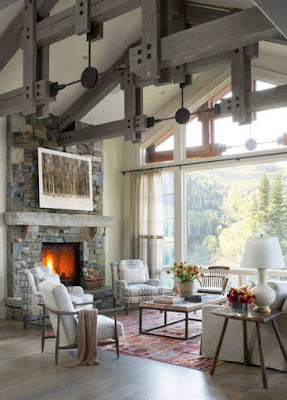 ِAdding beams to ceiling, Snow-white ceiling beams are suitable for the interior of almost any stylistic direction. Even a room with low ceilings will look light and airy, the white tone in the ceiling finish does not make the bedroom look worse, even if large ceiling beams are used. 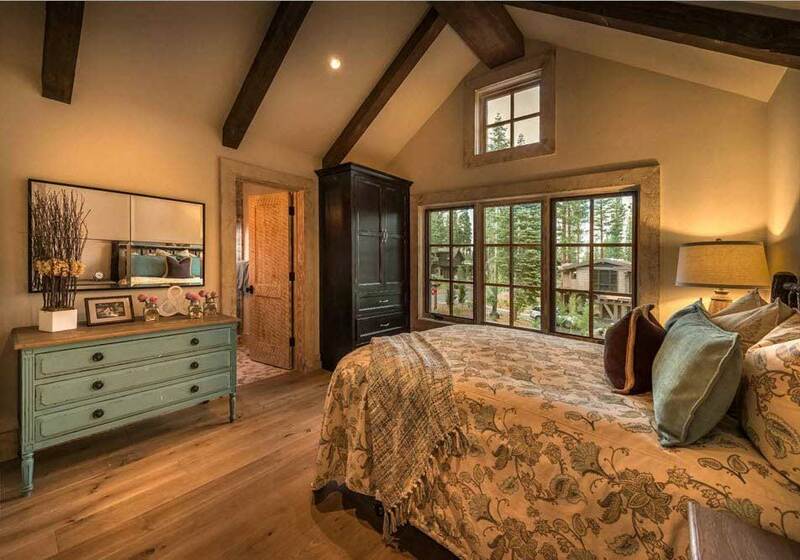 In a house built of timber, it is quite logical to see the ceiling beams in the form of logs and in the bedroom. 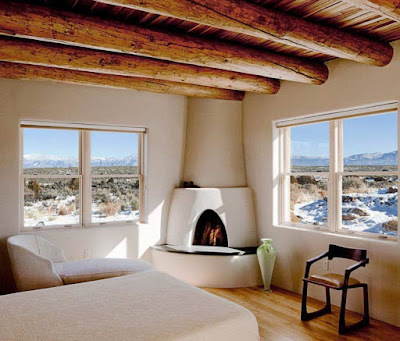 The proximity to nature, some rustic atmosphere, and a natural color palette will certainly favorably influence the atmosphere of the room for sleeping and rest. In such an environment, you can relax and prepare for a sound and deep sleep. Examples of design bedrooms in a rural style with the active use of wood as a finishing material. For decoration of kitchen-dining room of small sizes, white decoration - ideal for visual expansion of space. But in an absolutely bright kitchen space, it is difficult to avoid associations with the premises of sterile hospital wards, and the color temperature in these functional segments brings coolness. To give a light room of contrast, and hence the dynamics will help the ceiling beams from dark wood. 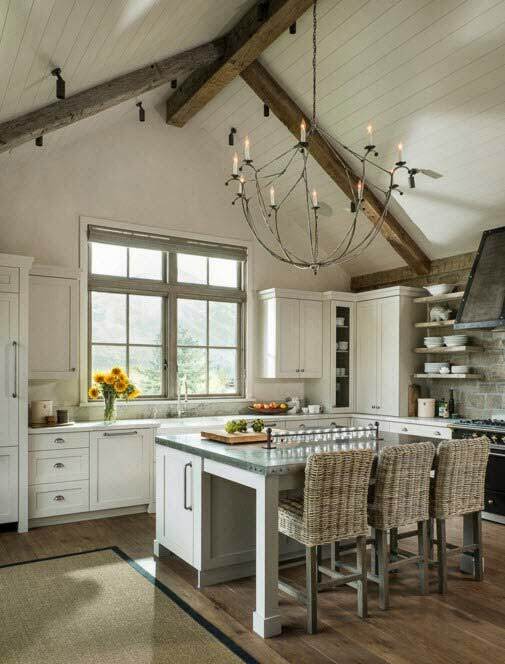 Scraped and deliberately untreated surfaces of wooden elements of ceiling decor will bring not only a special flavor but also the motives of rural life. 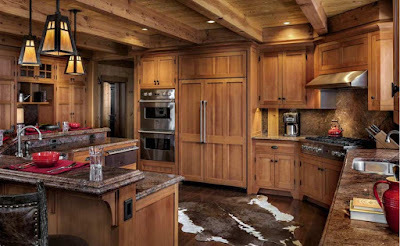 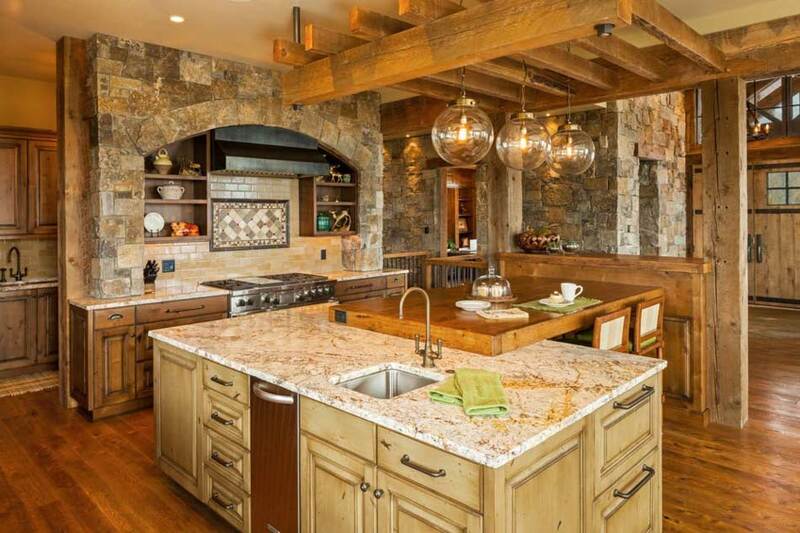 The kitchen, fully decorated with natural wood, involves the use of natural materials and for finishing the ceiling. 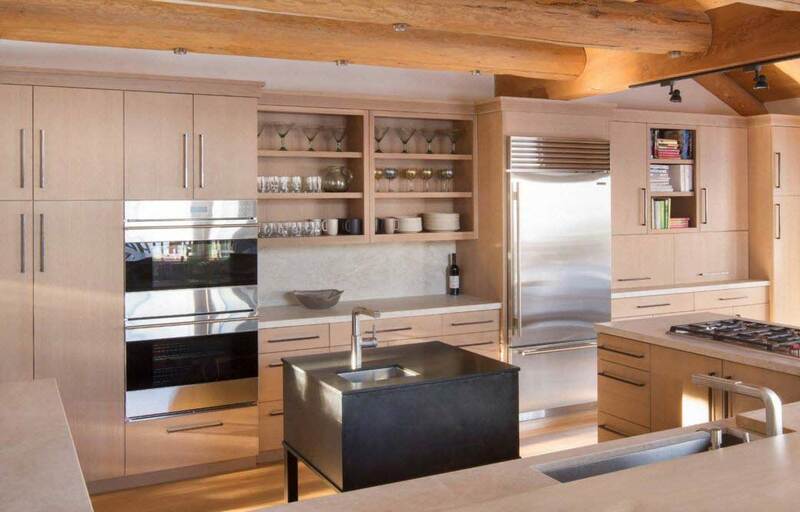 When the wooden facades of kitchen cabinets, located from the floor to the ceiling, meet with a similar material of the ceiling finishes, a feeling of infinite space is created. 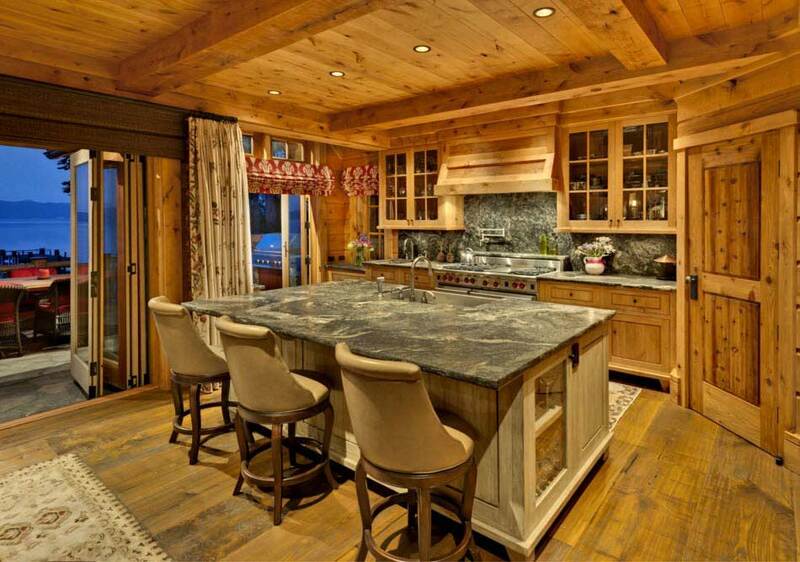 In this kitchen is warm and cozy. 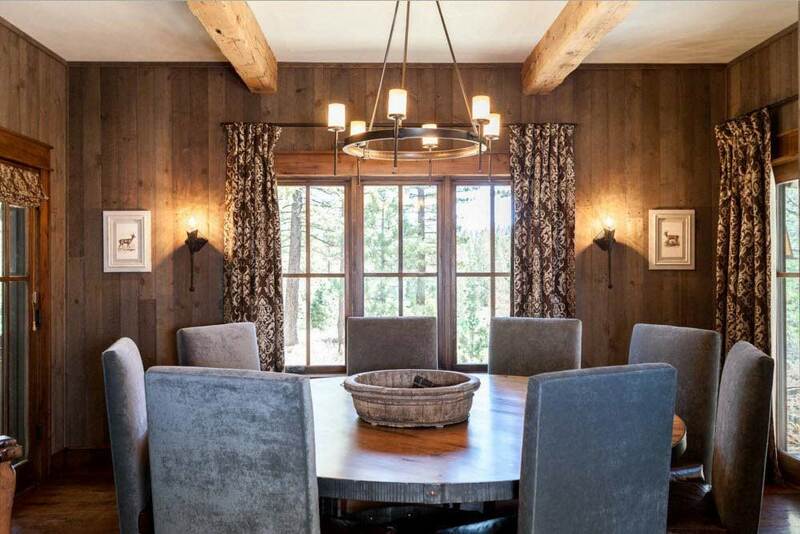 The dining room is rustic and comfortable. 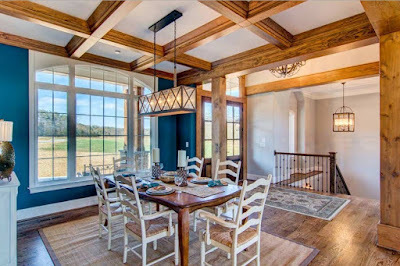 The abundant use of natural wood can create an incredibly warm atmosphere for both family meals and receptions for guests with refreshments. 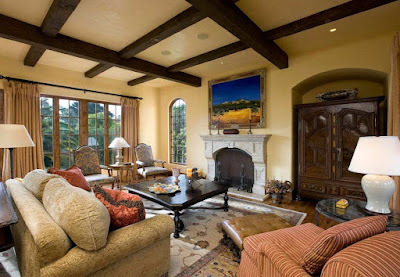 Wooden beams ceiling, in this case, play an important role in the formation of the character of the room, in which everyone will feel comfortable. 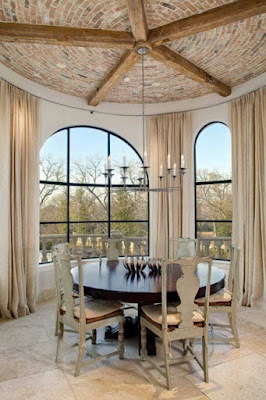 An example of the use of decorative ceiling beams when decorating the ceiling of a dining room located in a semicircular bay window. 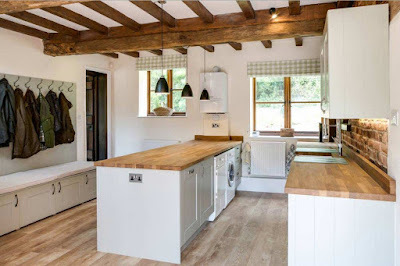 To bring a bit of rusticism into the traditional style of decorating the kitchen will help large logs as a ceiling decor. 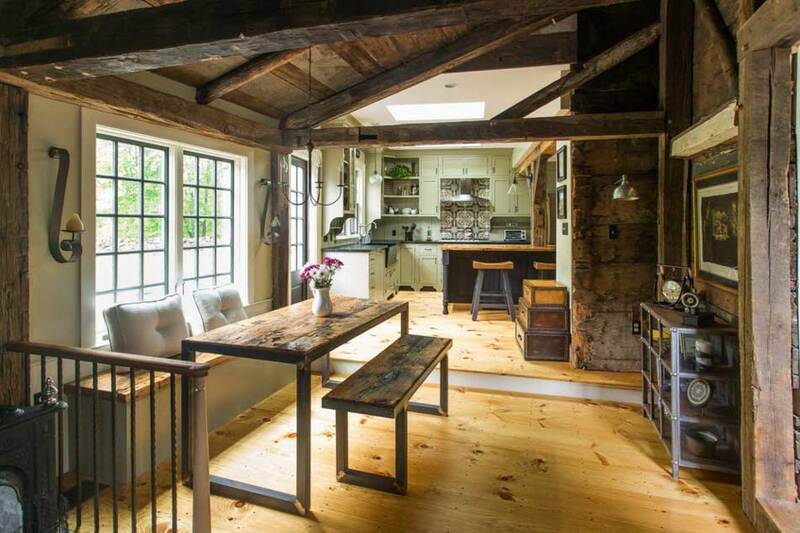 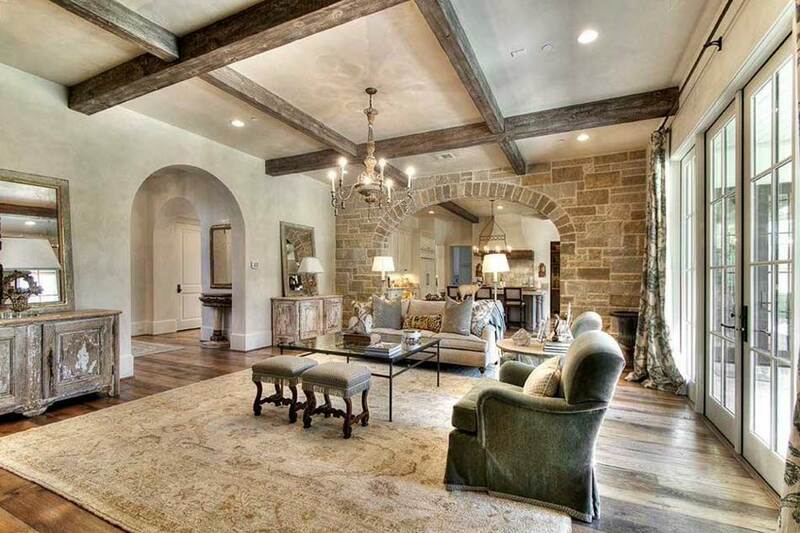 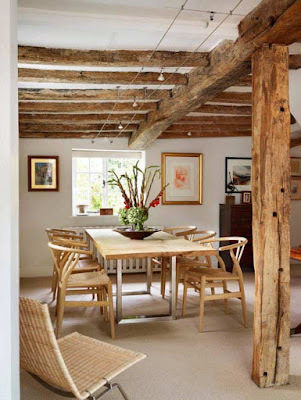 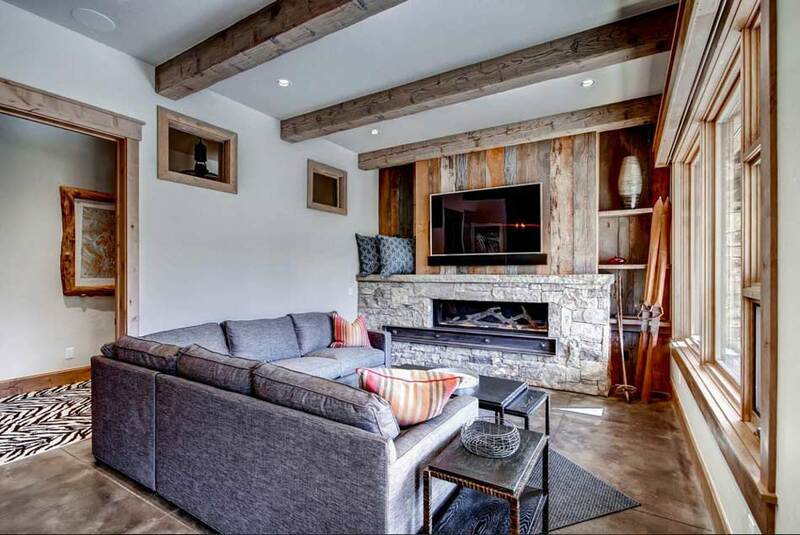 Roughly trimmed ceiling beams will look contrast not only in color but also in texture. But many interiors lack just such a "shake", originality. Stone trim and elements of wood often go hand in hand when decorating kitchen spaces and dining rooms. 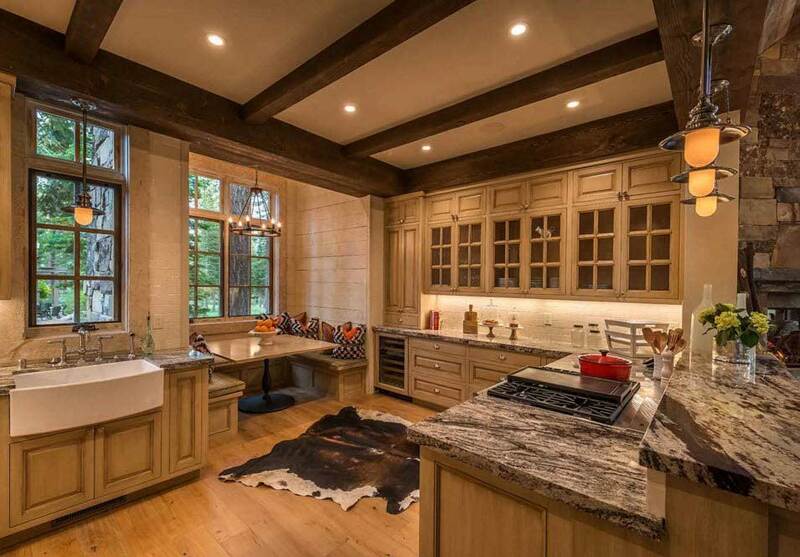 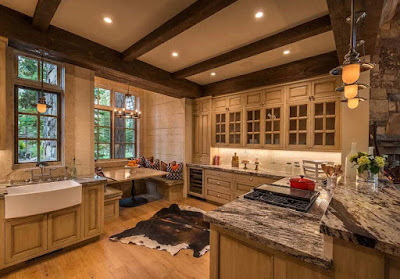 Rarely the use of stone decoration of the hearth, kitchen apron, pillar or other interior elements does without the use of wood for partial or even complete finishing of the functional space. 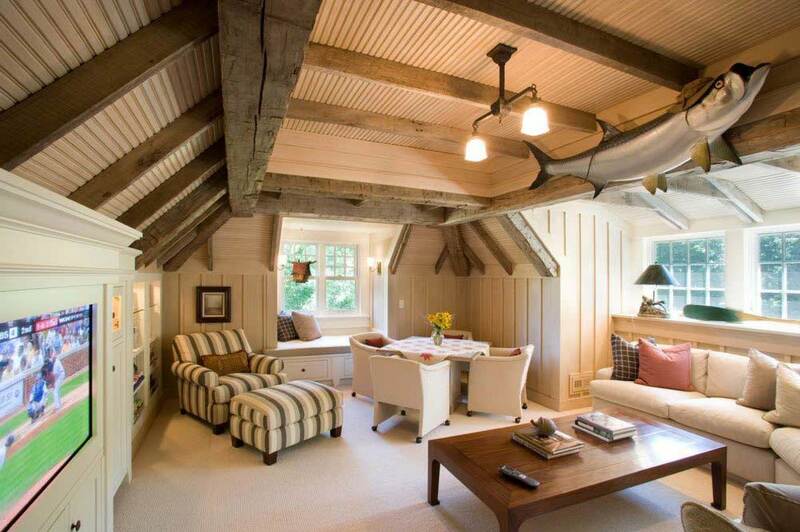 Well, the installation of ceiling beams, in this case, is the least expensive design technique. 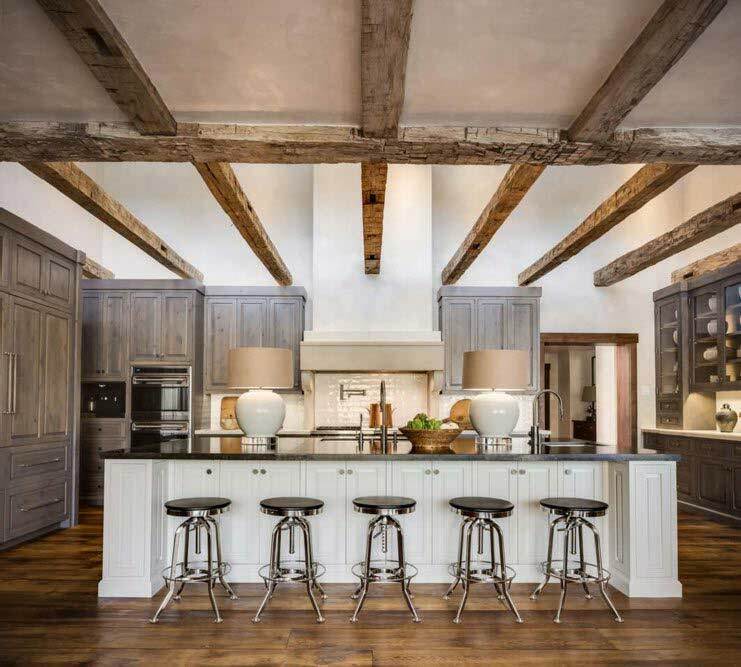 Ceiling beams painted "under the metal" will perfectly blend with the steel shine surfaces of household appliances or worktops work areas made of steel. 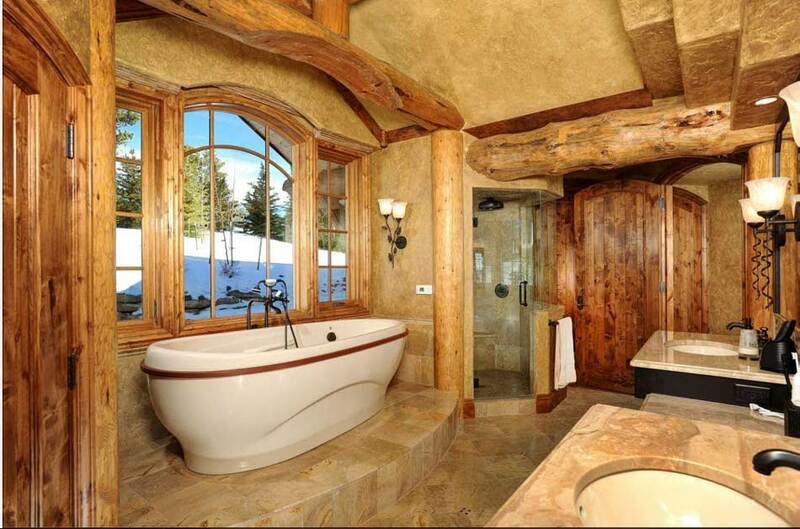 Meet the ceiling beams in the design of the bathroom in an apartment is not just difficult, but almost impossible. 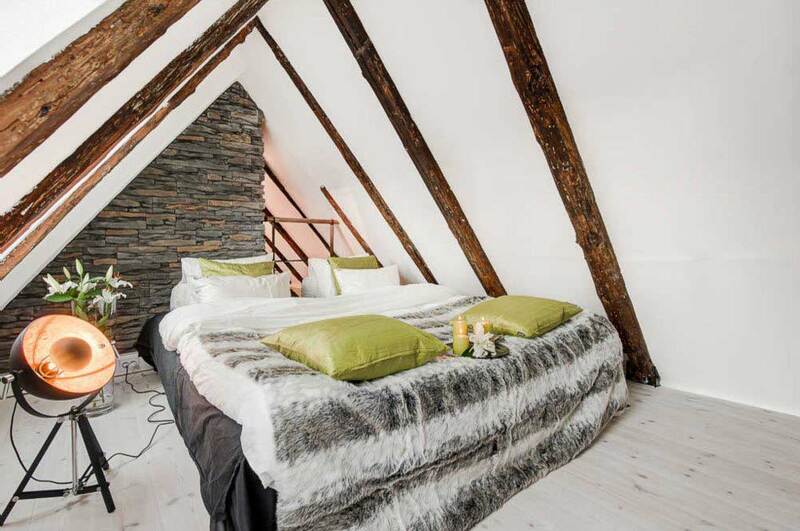 In particular, if we are talking about apartment buildings built in the last century, where there are few square meters and the ceilings are low. But in modern private homes of our compatriots for utilitarian premises are allocated considerable areas, and the height of the ceilings is enviable. 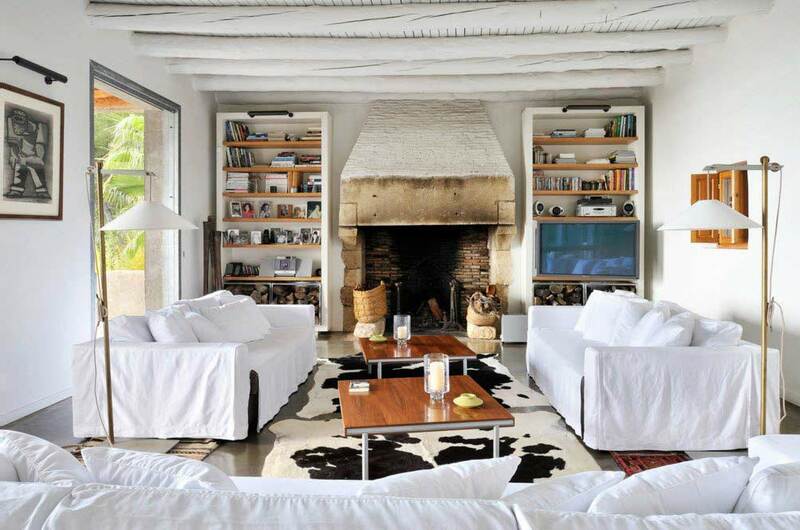 In such spaces, you can not limit yourself in choosing the style and motives for its manifestation. 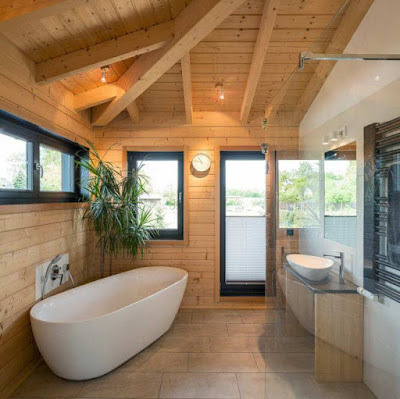 Many homeowners believe that the tree does not belong in the bathroom because of its low water repellent properties. 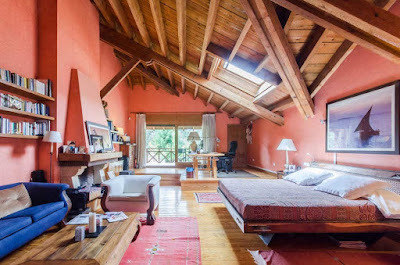 But there are two ways to solve this problem - first, you can use various antiseptic sprays, which treats the entire surface of the beams and special varnishes that protect the elements of the ceiling decor from moisture, you can also use a polyurethane analog of wood that normally tolerates high humidity of the room. But these ways of bringing rural motives into the interior of the bathroom are possible only if there is forced ventilation of the room. Hollow ceiling beams in the bathrooms can be used to build in the lighting system. Thus, it is possible not only to transform the appearance of the utilitarian premises but also to create a more secure environment, by isolating electrical appliances from moisture ingress. 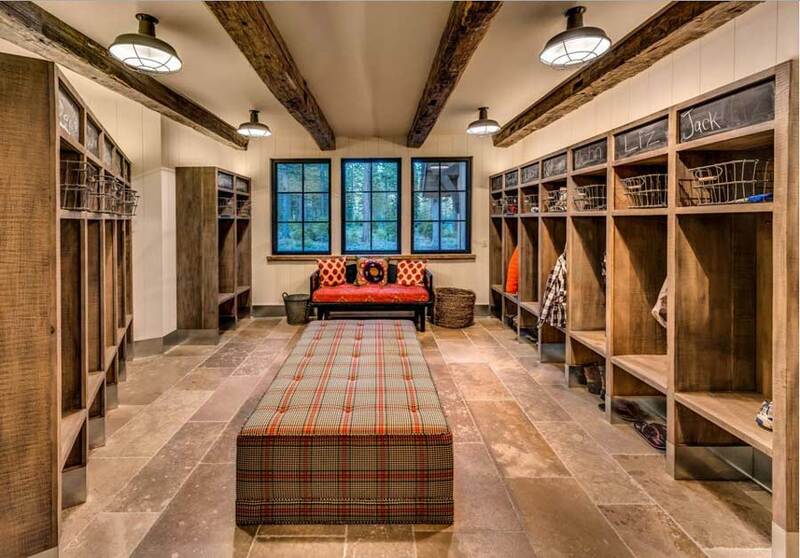 If the space of a private house is decorated with ceiling beams, then it is logical to use this design element not only in the main rooms, such as a living room or bedroom but also for the design of ancillary premises - hallways, laundries, wine cellars and even corridors. 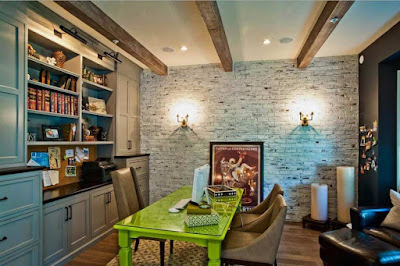 Examples of adding beams to ceiling in the design of the office or library space. It is difficult to imagine the design of a bath or a home sauna without the use of natural wood, and hence the use of such a constructive and decorative element of the interior, as beams overlap. 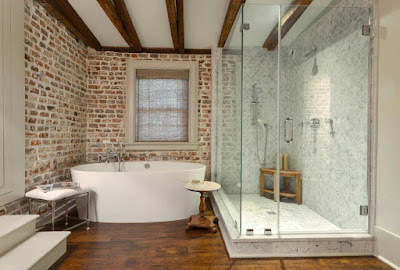 Typically, steam rooms are rooms of very modest size, which simply do not need high ceilings and the use of beams directly in rooms with maximum temperature is impractical. But the design of the so-called "waiting rooms" and restrooms in front of the steam rooms are excellent for the use of ceiling beams. 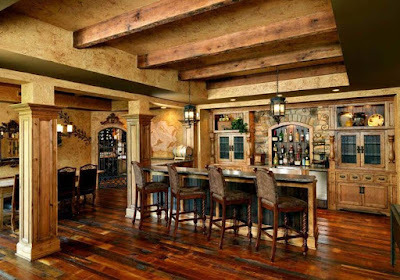 Country stylistics like no other is associated with us with the use of beams for the decoration of the ceiling. The active use of wood (in rare cases, its imitation) allows you to create a design of rooms that are in harmony with the surrounding nature. A slight negligence in the design of the premises allows you to create an atmosphere in which you can really relax and enjoy every minute of your stay in a comfortable and convenient environment. 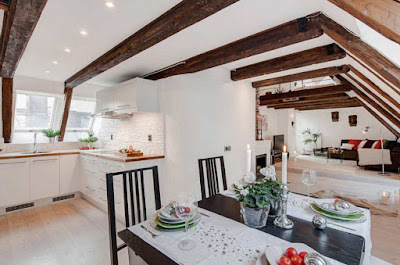 If a dining room or a kitchen is made in a maritime style (perhaps three functional zones, not excluding a living room connected in one space by an open plan), the use of ceiling beams to create a warm and cozy atmosphere is very common. 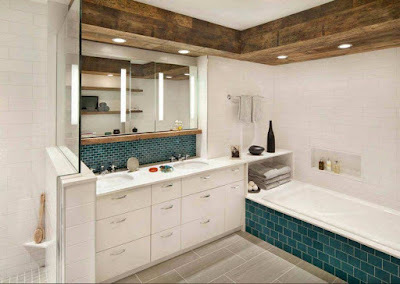 In the design of marine stylistics often prevails a cold color scheme - all shades of blue, active use of white. To bring a little warmth to the original interior of the premises will help elements of wood with an untouched natural pattern. Warm wood shades of beams from natural wood will look great on the snow-white ceiling. An example of the design of a bedroom in the naval style with the use of a complex design of beam ceilings. In the light and even airy image of the room for sleeping and resting, a complex composition of ceiling beams with dark fastener elements becomes the focal point of space that attracts all attention. 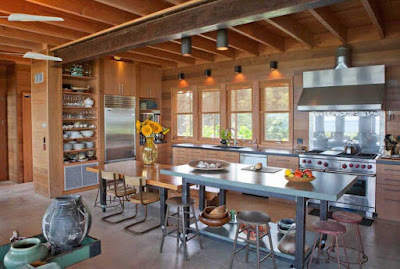 When using industrial stylistics in the interior of the premises, the following design techniques are most often used: open communications, ceiling and other ceilings, large spaces and open planning. 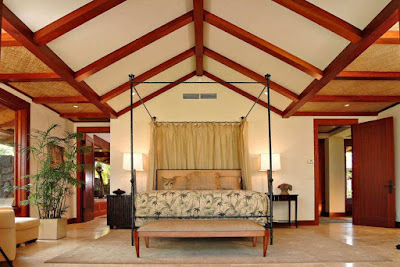 When decorating rooms in tropical style, you can often find a contrasting combination of light ceiling and walls with colorful and even bright elements made of wood to create edging surfaces, dividing them into sections. 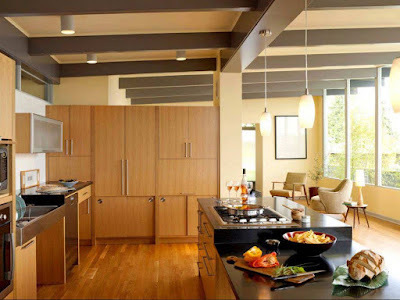 Often, in such sections are inserted tissue or cyme pieces (it is also possible to use bamboo). The resulting interior is never boring or trivial. 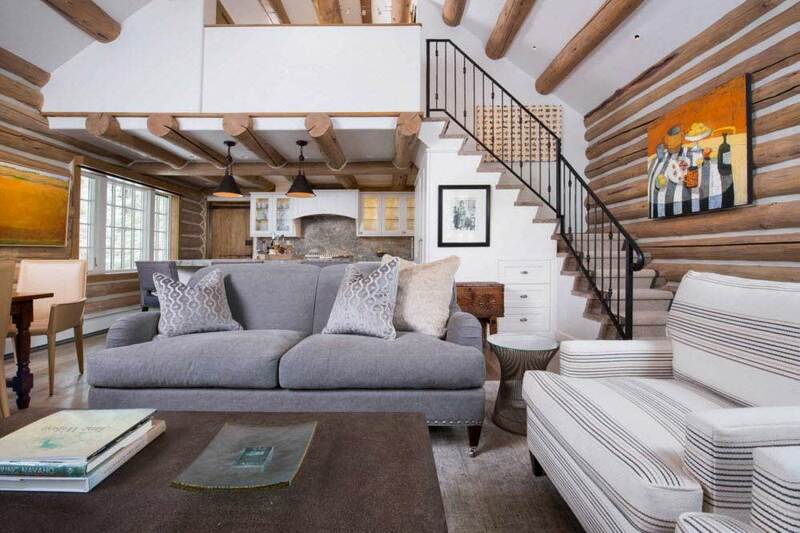 Modern classics look no longer pompous, as, in the inception of style, the premises retain a sense of spaciousness even with the use of luxurious furniture from solid wood with carvings and decor. 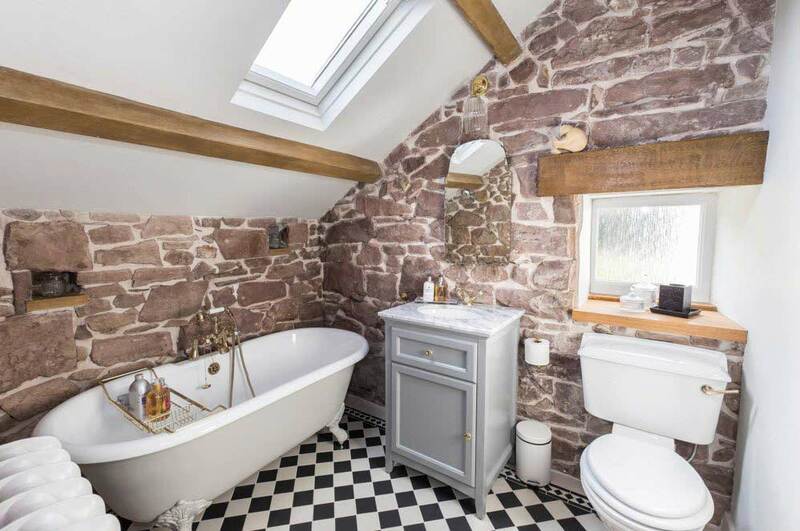 Neoclassicism suggests a more relaxed approach to the decoration of premises - rarely used expensive wallpaper with gold-plated embossing or abundant stucco for the decoration of the ceiling. 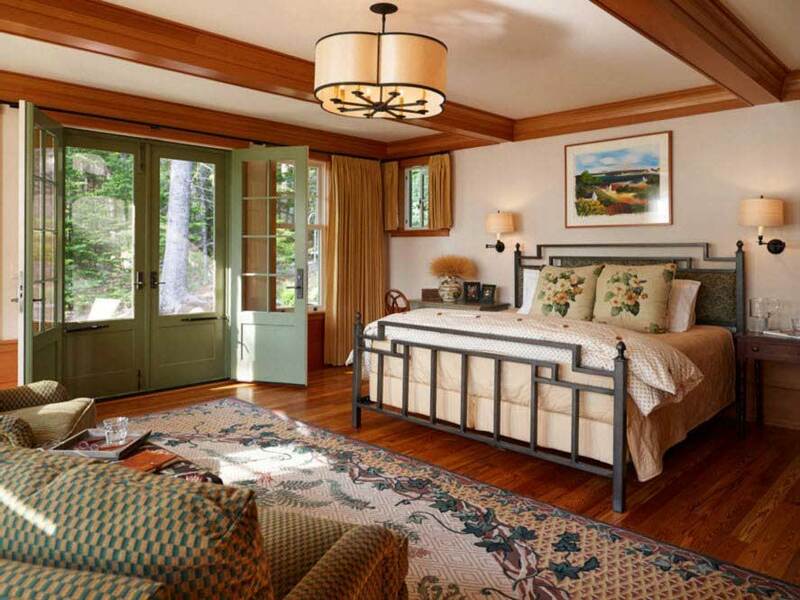 For example, in a bedroom with a large luxurious bed, actively decorated carvings, the ceiling can easily be decorated using simple and laconic in the shape and texture of natural color beams. 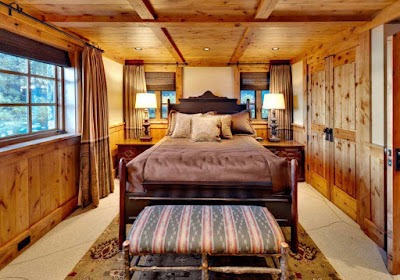 The bedroom in a classic style, with a fireplace and a snow-white ceiling with neat beams, looks luxurious, but cozy. 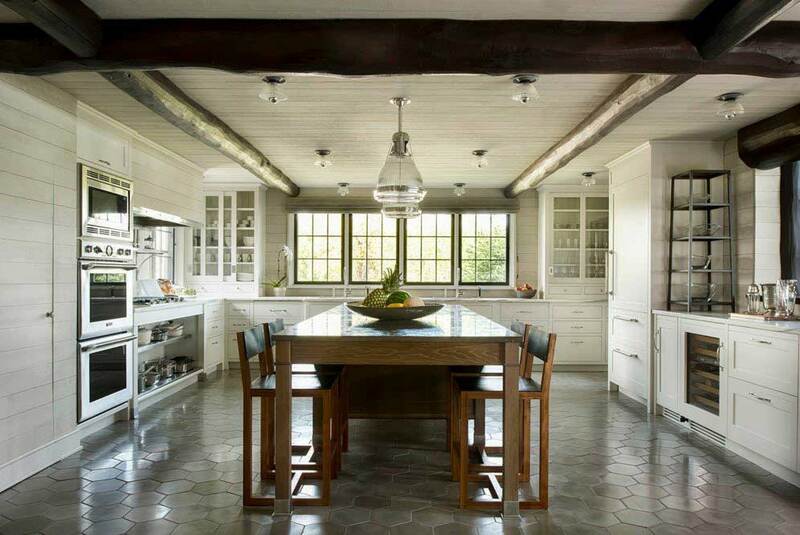 Stylistics, which came to us from southeast France, is known for its commitment to the use of natural materials. 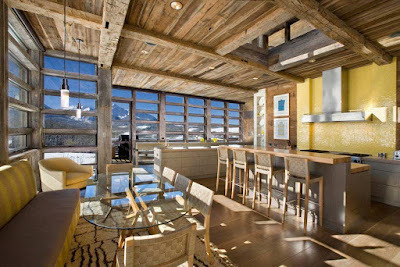 Style, the formation of which occurred in the complex climate of mountainous settlements, presupposes the strength and stability of structures that can serve more than one generation of the family. For the design of country homes, not necessarily located at ski resorts, wealthy homeowners often apply if not all the motives of the Chalet style, then some elements of this close to nature stylistics. 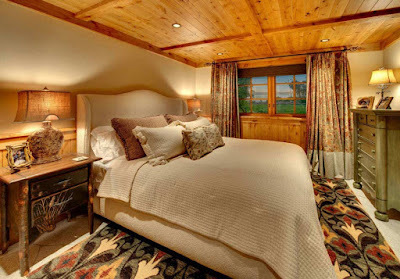 The decoration of the ceiling always reveals the belonging of the room to the style of the Chalet. 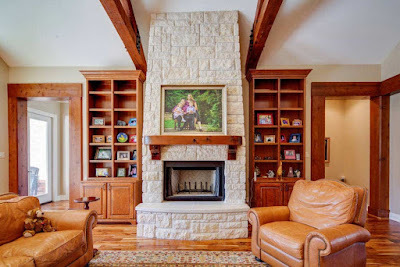 It is always a plentiful use of natural wood, the use of large beams, often passing from the ceiling to the walls, the organization of complex geometric designs and "interlacing" of timber or logs. 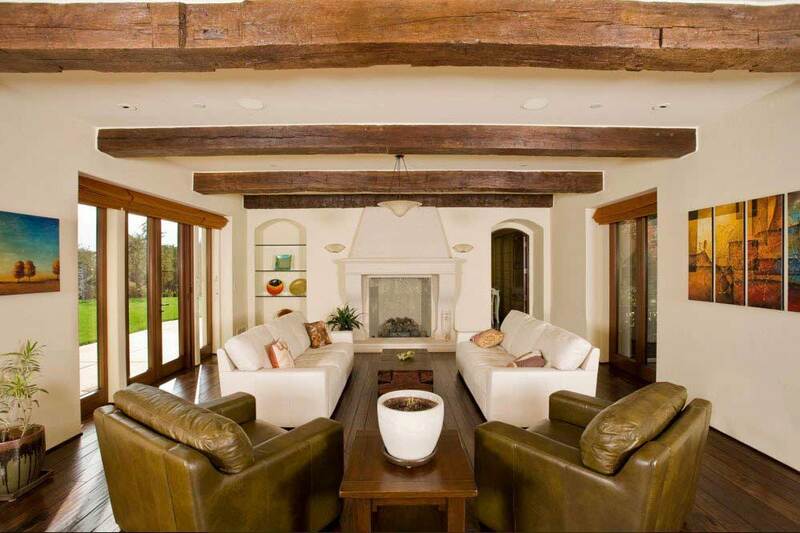 Ceiling beams made of polyurethane perfectly fit into the decoration of the room, decorated in a modern style. Small hollow beams are suitable for decorating the ceiling, both in private houses and in apartments. The living room or bedroom with a simple finish, laconic and functional furnishings and a minimum of decor will be transformed using beams "under the tree". 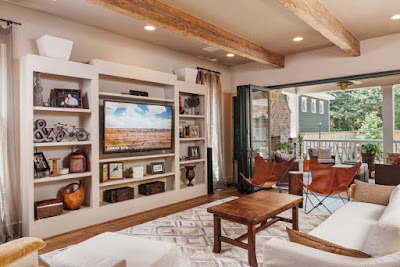 When decorating rooms in minimalist stylistics, one can meet the use of ceiling beams to give the interior a touch of home warmth and comfort, as spaces decorated with a minimal amount of furniture and a complete lack of decor can look like public spaces. 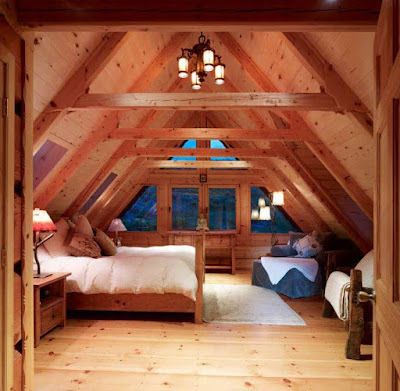 In the bedroom space, there are no associations with the office space, but the use of even a pair of beams for decorating the ceiling will bring warmth to the design of the room for sleeping and resting.